Just wanted to share this test for a renovation project. Glad to hear comments, critique or whatever! There is nothing particular that stands out as bad so absolutely nothing major or even mediocre so the only thing i could add would be if you were trying to go hyper realistic. 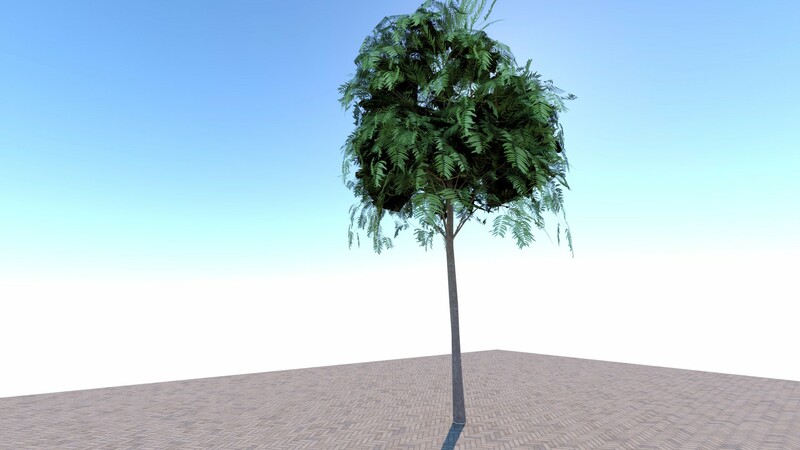 Even then, the only thing i could think of to nitpick are the leaves are super flat on the plant on the left to be used so close to the camera. The floor should have some debris on it like leaves or dirt or something (maybe with that spray plugin that was mentioned on the other recent thread) and i don't know why but where the building hits the ground - the light or shadow doesn't seem consistent between both as in on the left section close to the camera - the building is super dark but the ground is relatively light right next to it. It almost seems copy/pasted onto the ground. 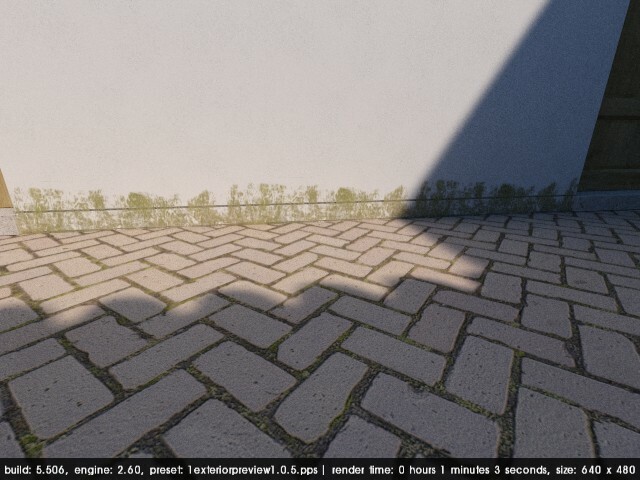 Maybe a high quality render would add more depth to the shadows if it's only a default render. The metal window frame mid left should probably have a slight reflection and maybe a slight round-corner. the fov may be slightly sharp as well as i notice a fish eye on the sides. the stairs seem a bit steep as they go to the 2nd floor behind the tree. Again, only nit-picking. It's really solid and mostly simple with just a touch of something more which i really like. One last thing but would the cantilever over the door be able to physically work in the real world without some bracing? It looks fragile if concrete but maybe there is rebar in it. im not very familiar with architecture in warm climates. i like the blurry leaves shadow mixed with the sharp ones. i like the floor with the special cutout for the tree. Is the floor just a texture or something more? 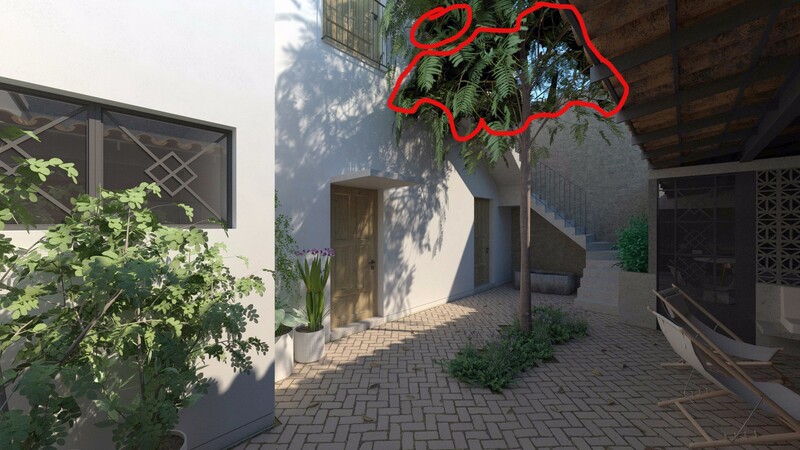 Also, is this a personal project or a work render? yeah, that cantilever concrete would be tricky to build, good anchors with the main structure and good engineering skills ( local bricks and "adobe" in some walls and "rigid concrete frames" - I don't know the English name for that-) a lot of reinforcing and work to be done but is totally doable. the floor is a texture from texture.com with a heavy bump, just pushed down some bricks and put a moss texture on the low surface. is a personal work for a friend in my hometown, so there's no rush for delivery is for personal practice and experimentation. There is something so satisfying seeing a render turn into real construction. I love the before and afters just to compare/contrast and enjoy the satisfaction of completion. Very cool! The floor is cool. I just tried the plugin "floor generator" and I love it already. It will automatically create real polygon tiles in various shapes for floors or roof tiles or whatever. Since the tiles are separate, you can have a separate lower layer for the (which is also left in when using the plugin) caulk or dirt in this case and have it colored or tiled or uniquely detailed. The best part is that it can randomly shift the tiles and shift the start point of the texture used in it so it looks very real and convincing. Put that in your backpack of tools and try it out (not that you need it here)! The bump really adds depth that I thought maybe you were using this plugin already. The moss is interesting on the wall but you want it to be random and sparing otherwise it will start looking like a video game. It's a great touch on the tile cracks. I didn't even notice before but it adds to it in subtle ways. yeah for the moss on the wall I was thinking about more something using this texture more random and organic, but just some maybes. I like that texture. I wish we could add multiple textures to a plain to add something like this more easily. i've done what you said - offsetting it a bit or rendering separate times with different textures and combining in photoshop but it's tedious to add these effects. I'm getting ready for winter here way up north in chicago you lucky dog... 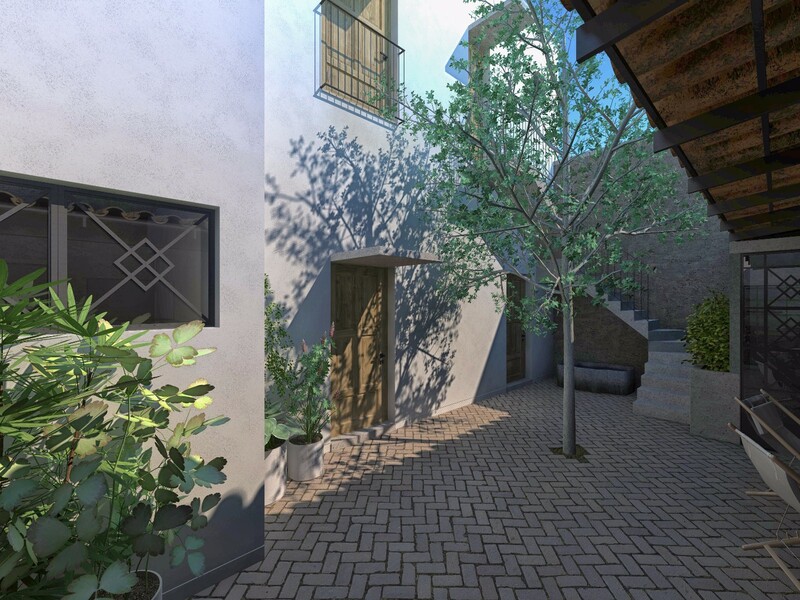 I'll have a corona and think of warmer times while I look at your renders! and now you remind me that I need a beer! You can add things like most to walls, you need a transparent png texture applied to a separate plane, floated maybe 1-2mm in front of the main wall. In your first render, that Aquilegia is actually a really small low-growing plant. You've scaled it up, in reality, the leaves are only around 15mm in size! Porch is easy enough if you have a concrete frame somewhere near. 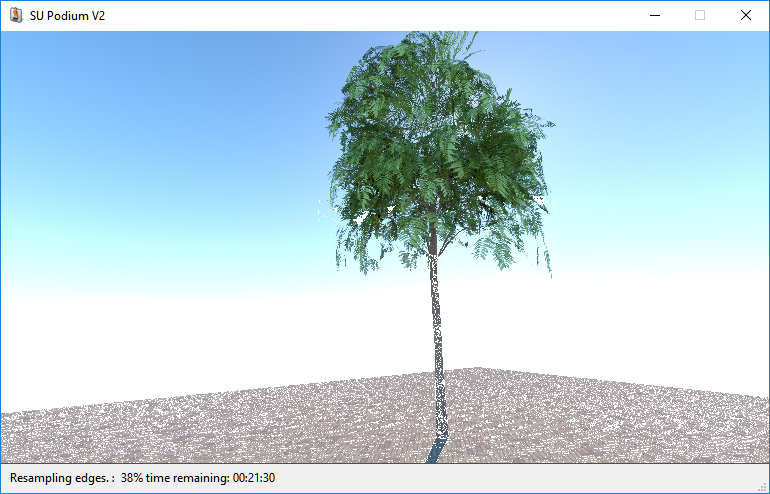 about the leaves on the lupin it's not the first time that happens (I mean not only happens this time with the lupin, other time with other plants) suddenly the render appears like that and the model inside skp is ok, I just changed that plant to see what happens... I changed the transparency to 92% maybe that was it? any ideas for the black areas in the tree? Ah yes, that looks like the recursion depth variable in the presets. You can edit this yourself with a plain text editor like Notepad on Windows or Textedit (plain text mode only) on Mac. Increase the value of the variable __lightbounce to 20. Don't increase it to more than 30. Make a copy of the original preset, and modify the copy. You can create a new or updated version for every preset you want to use. No problem! I got it, let me try it! Thanks Big! 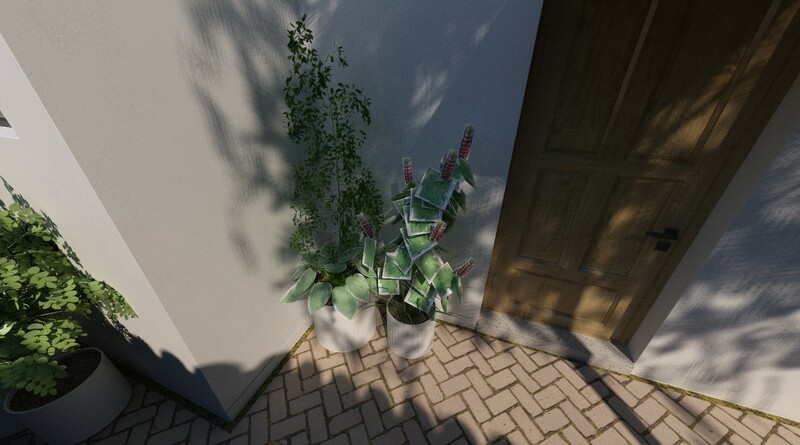 for exterior work I use the exterior vegetation preset almost exclusively. 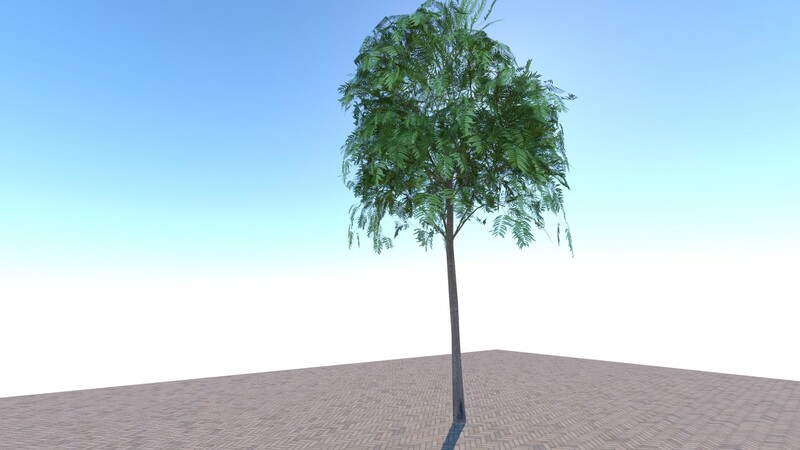 The vegetation preset had precisely this modification. Nothing else is changed.